The Centre for Pharmacy Postgraduate Education (CPPE) is part of the Manchester Pharmacy School, within the Faculty of Medical and Human Sciences at the University of Manchester. It is funded by Health Education England to provide educational solutions for the NHS pharmacy workforce to maximise its contribution to improving patient care. 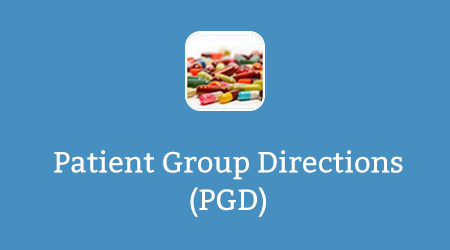 The aim of this e-learning programme, which was developed by CPPE, is to support people and organisations who are considering, developing, authorising and using patient group directions (PGDs) to deliver NHS services in line with legislation and NICE medicines practice guideline (MPG2). Whether you are a commissioner or a provider, this programme can support you. It signposts learners to a wealth of resources, including a PGD website which contains answers to frequently asked questions and includes information on competency frameworks for people who are developing, authorising, reviewing, updating and using PGDs. Access it today to learn how PGDs can be used in your practice as an appropriate means of patient care. refer to and contribute to the local practice collection on PGDs on the NICE website. If you already have an account with e-LfH, then you can enrol on to the Patient Group Directions programme by logging in to the e-LfH Hub, selecting My Account > Enrolment and selecting the programme. You can then access the programme immediately in the My e-Learning section. The Patient Group Directions programme is also available to NHS healthcare staff via the Electronic Staff Record (ESR). Accessing this e-Learning via ESR means that your completions will transfer with you throughout your NHS career. This programme is also available to access freely and without the need for registration via www.cppe.ac.uk/links/pgd. Please note that your progress and completion of the programme via this site will not be recorded.